Home » 1 » CAN A HEADLESS BODY MOVE? CAN A HEADLESS BODY MOVE? 16 years ago we wrote a story that Baba Deep Singh phenomenon is possible. 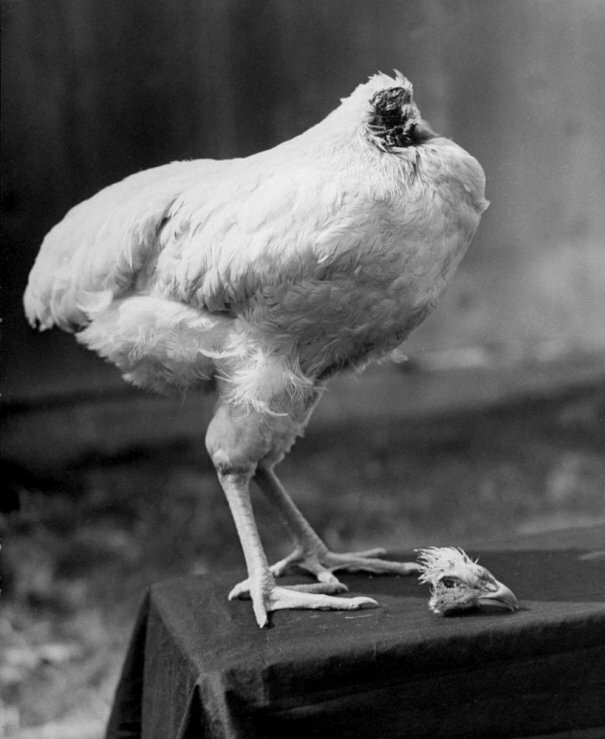 Today I saw a story on Discovery channel how in USA a headless chicken survived for 18 months from 1945 -47. His owner toured far and wide to show it alive. I searched the net and have found links to that. Here is a Wikipedia one. 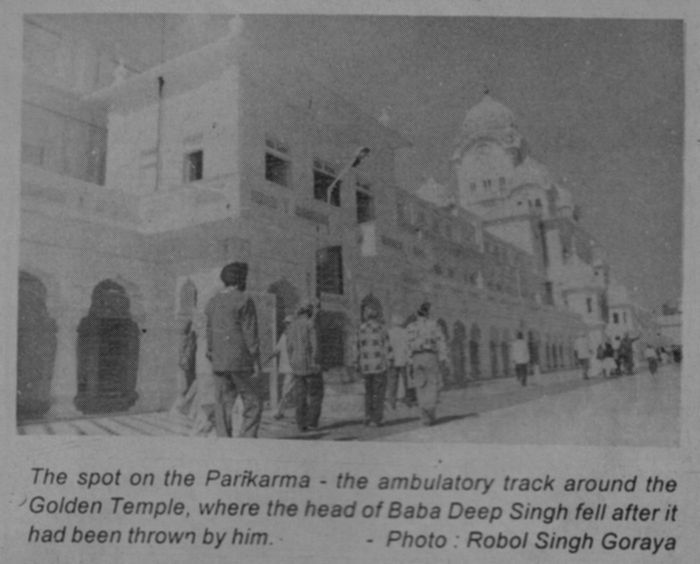 Ahmed Shah Abdali demolished Golden Temple with gun powder and filled sarovar the tank with debris. In 1757 AD, to restore the sanctity of shrine Baba Deep Singh marched towards Amritsar. 5 miles Short and he was intercepted where a skirmish took place. With one stroke of sword Jamal Khan beheaded the Baba. But the Baba had vowed to reach Amritsar. He held his head on the palm and continued to move towards Golden Temple. Seeing a headless person moving the enemy panicked and fled. Obviously a huge crowd gathered and Baba reached Golden Temple where he threw his severed head and fell. The cynics have been casting doubts on the story. But here is a scientific proof that it can happen. 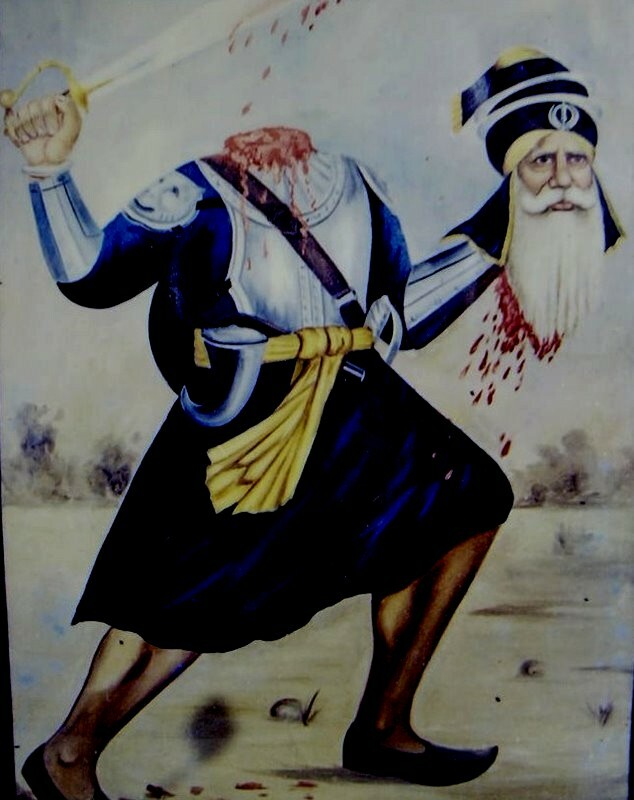 Add cThe great warrior Saint Baba Deep Singh in a walking posture with his severed head held in one hand and a sword in the other. The paranormal seems weird and strange to us, we therefore dismiss it as something incredible for we think that it is only a fantasy created by our fevered or inflamed imagination. But there are depths within us which remain unexplored and unplumbed by most of us. Paranormal happenings are not normal' or 'ordinary and as such they belong to that borderline area where the body and the mind are transcended at times and a relationship occurs between consciousness and the objects of awareness in a flash. But we know only about matter and deny the spirit, we are acquainted with gravitation and have no idea of levitation, we know only the outside and are not aware of the-inside 'of things. In this article, Dr. B. S. Yadav shares some of his personal observations and insights with our readers and quotes some instances to prove his point. He says apart from the brain, we have the 'gut brain' which becomes operative and keeps even a headless body moving for sometime, if it is deeply motivated by the rgut brain' to do so. It is a well-known fact that the Gut Brain of an embryo in the womb is the first to develop and work, and the actual heart and the brain begin to function much later. By inference we may also say that the gut brain can be the last to die, after the heart is stilled and the brain is silenced. It has been observed that when a person dies of a cardiac arrest, his heart is stopped, but his brain remains alive for about four minutes. But even after the brain has died, his facial hair keep on growing and even a closely shaven person at the time of death, if kept aside for three or four days, grows a clear, stubbly beard. It proves that when a person is declared dead something still remains active and functional in him for sometime. Para-psychology believes that this post-death activity is due to the gut-brain which dies much later. The Japanese call it the "Hara Centre" and it is located somewhere around the periphery of our navel centre. The other day I was struck by a newspaper report that the human body has two brains. One of course is inside the skull. The other, hitherto, unrecognised, is the 'Gut Brain', close to the gastrointestinal tract. The gut-brain is reportedly more primitive and better developed in comparison to the popularly recognised convoluted organ lying in the helmet of the temporal bones called the Brain. This grey matter took shape much later to share the increasing work load of the gutbrain as man evolved more complicated and complex functions. The above mentioned details triggered the recall of two bizarre incidents in my memory. One was related to me by Pawan Kumar of 'Patiala Chicken Centre' in Saharanpur. When busy in his daily chore of dressing broilers, he noted that one of his slaughtered birds refused to die. The be headed creature stood calmly and walked a few steps. The avian remained in this position for hours together bleeding profusely from the cut end of the neck. A Granthi from a nearby Gurudwara finally came in and recited some sacred words from the holy Gurbani for the peaceful death to the poultry bird and it dropped dead after some time. It is often noted at the poultry farms, where these chicken are dressed that when a bird is decapitated sometimes suddenly, because of a weak grip, its body gets released from the hold. It then flies quite high, beating its wings with amazing force, till it drops to the ground after sometime. After decapitation there is something still left in it which propels it to fly and escape with such unimaginable force. It is attributable again to the functioning of the gut-brain. For the headless body has no brains to give it directions. Another incident was narrated to me by my uncle. He chanced to enter into an intimate chat with a recluse who came to him for alms. Out of curiosity he asked him as to why he had renounced the world and become an ascetic at the prime of his youth. The man in orange robes reflected thoughtfully and confessed that he had committed a murder. The victim was asleep when he chopped off his head with a chaff cutter. However, he was petrified to see that the headless trunk got up, stood firmly on legs and made a frantic effort within the four walls of the room to grab his assailant. Terror stricken, he dodged and cut corners as the body with the bleeding neck moved with spread-out arms attempting to enclose him in his bear-hug. The incident shook him to his roots and he frequently had nightmares of a headless man trying to have him in his deadly embrace. That made him walk out in search of peace and he thus renounced the world. The wall picture of a valiant Sikh warrior Baba Deep Singh having a sword in one hand and his own severed head in another now appears plausible to me. There are different kinds of paranormal phenomena in which the gravitational force is transcended or gets so greatly diluted that it eases to have any effect on men or things. Thousands have witnessed in this century, in wonder and amazement the performance of Vaslav Nijinsky (1892-1960) the famous Russian dancer. He used to dance sometimes with such ecstasy that he would jump incredibly high into the air and then return to the stage slowly falling like a bird's feather. It is proved from his case that the effect of gravity can be nullified and thus things can be teletransported to great distances also defying the pull of the earth. Though yet to be scientifically proved there must exist some kind of anti-gravity or levitation like we have in the theory of anti-matter against matter. Obviously science is yet to cover many more mile stones. Interestingly (Swamy) Dayanand had, autopsied a human corpse and found no trace of Nadi Chakra through which the cosmic energy is said to flow. Dismayed, he had thrown the two books, The Hathayoga Pardeepka and Yogabija, into the Ganga for, he said, they carried misleading information. The 19th century saint at that time had formed that opinion as per the data then available. E.S.P. and parapsychological and other scientific researches were not obtainable at that time. Hitherto fore it was believed that the matter is indestructible while now it is proved that our notion about matter is illusionary and it is only a condensed form of energy and the matter as such does not exist. It has been proved in the light of numerous modern findings that our brain and muscles, when trained to do certain things, can do so through reflex action when our brain is totally at rest or engaged somewhere else. For example, we have seen that a man behind the steering wheel, while driving is busy in solving his problems mentally, and his hands and legs are engaged so perfectly and flawlessly in operating the accelerator, the brake and the clutch. It clearly goes to prove that our brain and muscles can be trained and habituated to perform these functions for sometime independently of the brain also. Science and philosophy seem to be ultimately converging to the same point. With the concept of the gut-brain now deeply probed, the common saying "have guts' appears much scientific and virtually refers to some deep visceral impressions fed into them. Therefore the concept of two brains, the one in the head and the other in the belly seems to be gaining-ground in the light of modern researches and the many experiences which are being brought to light daily throughout the world. here is my experience in kenya where i had to cut a chicken for my evening meal.as the grip on the chicken laid on a slab while sitting down the poor creature flew out of my hand and circled the lawn where this feat was performed in a crowd to check how khalsa i am to do away a bird let alone other animals like goat and bull.it was the experience which made me aware how hard is to kill the physical form let alone the spirtual one.Jai ho khalistan kee.i am still a meat eater.